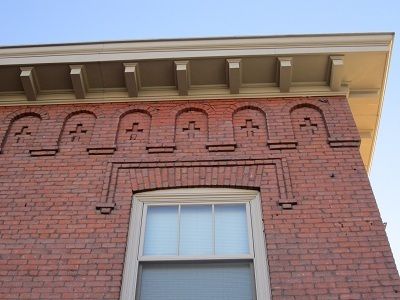 The building today known as University Pharmacy in the Gonzaga district of Spokane has served the community since its construction in 1909 by the Pioneer Educational Society (PES) and the Spokane Architectural firm, Preusse & Zittel. Over the years the building has housed such popular business's as the Snappy beer Parlor, Jack and Dan's Tavern, and of course, University Pharmacy. The building was one among many others built in between 1894 and 1910 when the PES and Jesuits founded the Catholic neighborhood around the campus of Gonzaga College. Among the first buildings constructed during this period were the Holy Names Academy, St. Joseph's Orphanage, and the St. Aloysius Cathedral. The pharmacy building itself is a two-story red brick building fronting along the east side of Hamilton Street, on the southeast corner of Sharp Avenue. The first floor usually housed two business's until 2003, when the University Pharmacy closed and the building exclusively became Jack & Dan's. The second floor still functions to this day as two second-floor apartments. Although this building has been used by a few different businesses, The building will probably be most well known for its association as Jack & Dan's Tavern. 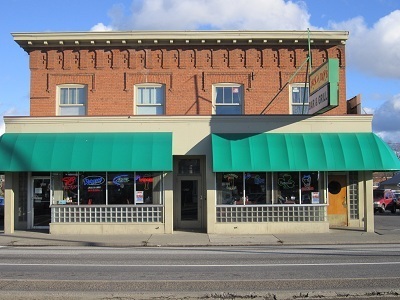 The tavern became popular with the community as the center of the Spokane sports scene. It served the Gonzaga community as a neighborhood gathering place for sports enthusiasts. Joey August, who owned the tavern in 1947, is largely responsible for making the tavern a hub for Spokane sports. 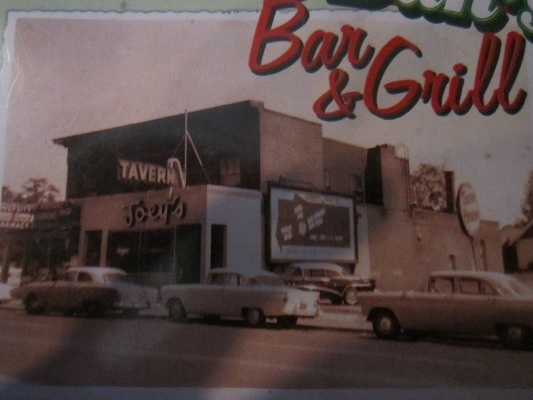 A boxing coach for Gonzaga University, August made the tavern a popular sports bar in the 1950's. Over the years, the bar has served famous sports figures, including Tommy Lasorda, Spokane Indians baseball players, and Utah Jazz fans watching hometown hero John Stockton. Jack & Dan's is one of only a few beer parlors that have run continuously since the repeal of prohibition in Washington in 1933.Even before it was Jack & Dan's, Snappy's Beer Service was one of thirty-five such parlors in 1934. Snappy's was the first business to occupy the building. According to local historians, Snappy's was a delivery service capable of delivering a "bucket of suds" by motorcycle to anyone within a 2 mile radius. Since 1910, the building had housed a number of pharmacy's under different owners. The University Pharmacy was founded in 1939 and continued on until its close in 2003. The closing of this pharmacy ended 83 years of pharmacy service to the Gonzaga neighborhood. The closing of the store exemplifies the end of locally-owned pharmacies in Spokane and the switch to supermarket and drug store chains which became dominant. The residents of Spokane may know the place under all its names, Snappy's, Joey's, Jack & Dan's, or University Pharmacy, but to generations of Gonzaga students it was essentially gathering place. 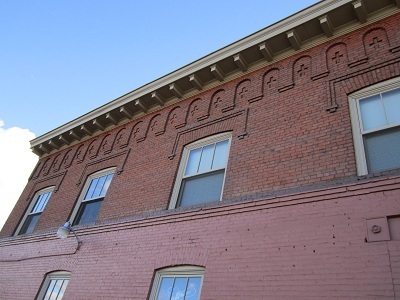 The building was built when the city of Spokane was in a state of construction. It survived the prohibition of the 1920's and emerged as a popular sports hub for Gonzaga sports. Before its close in 2003, as always, students still flocked there to watch the game. 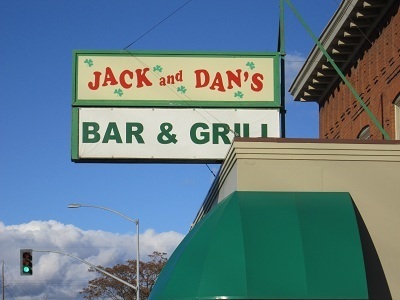 Jack & Dan's tavern: After University Pharmacy closed in 2003 the building became exclusively, Jack and Dan's. Image by Lucas D. LeCaire. Photograph showing the building when it was called Joey's. : Joey August helped to make Joey's the hub of Spokane sports. Image by Lucas D. LeCaire. Lucas D. LeCaire, “University Pharmacy,” Spokane Historical, accessed April 21, 2019, https://spokanehistorical.org/items/show/280. 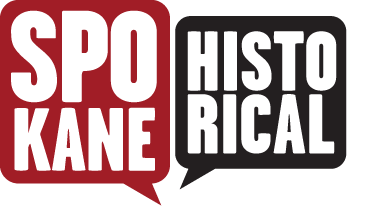 Jim Kolva, "Spokane Register of Historic Places Nomination Form," Spokane City Hall. 2005.